LAKE ELSINORE, California (CNN) -- The two-story homes on Fir Circle in an upscale Lake Elsinore, California, neighborhood tell two stunningly different tales. Mary Ann and Derrick Lepley bought a home for nearly $300,000 less than what the previous owners paid. Some are vacant, bank-owned and beat-up inside. Others are filled with kids' laughter and the sounds of boxes unpacking and families moving in. Mary Ann Lepley, her husband, Derrick, and their 2-year-old daughter, Melody, have been in their 3,000 square-foot home here for about three months. They bought it for about $250,000. Just two years ago, amid California's housing boom, the same house sold for nearly $550,000. "My heart goes out to everybody that lost their home [and] lost their jobs," says Derrick Lepley. "I'm real sympathetic toward them. But the reality for us was, if this didn't happen, we wouldn't be in this situation." Walking through his spacious four-bedroom home, he says, "We feel fortunate." With the nation facing historically high foreclosures, many Americans -- like the Lepleys, who have been cautious with their spending and savings in recent years -- are using this opportunity to buy their dream homes, large comfy places that once seemed completely unattainable. "Right now any distressed property that goes from being available to being occupied is a good thing, because it reduces inventory on the market," said Rick Sharga, senior vice president of RealtyTrac, which lists 1.8 million foreclosed and bank-owned property across the nation. "Even though the properties are selling at a dramatic discount from a couple years ago, in most of these markets, the simple truth is that the properties were wildly overpriced -- and only able to be sold because there was such recklessness in lending practices." Lake Elsinore is in Riverside County, one of the hardest hit counties in the nation's foreclosure mess. The scenic community about 70 miles southeast of Los Angeles is dotted with large suburban homes. The streets are lined with "for sale" signs. "The banks have dropped the homes tremendously in the past few months and homeowners that usually couldn't purchase before are being able to purchase at very low prices right now," said Rachel Morales, a realtor in the area. Nearly 23,000 homes in Riverside County alone are listed as "bank owned" on RealtyTrac. One in 80 homes is now in the foreclosure process, according to the county assessor's office. "Riverside County is in the middle of the mortgage meltdown," says county assessor Larry Ward. "It's really tough on people, the foreclosures and prices that dropped below $100 a square foot." Next door to the Lepleys are Frank and Leslie Aceves. They are in the midst of a different situation. They are trying to "short sell" their house in order to avoid foreclosure and lose everything to the bank. 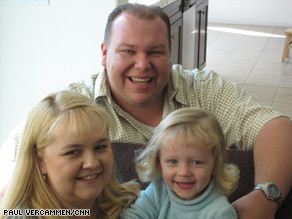 The couple has two children, ages 10 and 3, and they bought their 3,500 square-foot home for $620,000 a few years ago. A house about the same size across the street recently went for $267,000. "We just didn't think it would happen," Leslie Aceves says of the massive drop in prices. "We just thought it would stop somewhere." Neighbors Shane Latham and Kathy Valdez, a couple in their 20s, bought their house for $220,000 -- nearly $300,000 less than what it was a couple of years ago. "We've got to feel for people," Latham says. Valdez adds, "I'm in my 20s. I mean, why not? A house right now, we could afford it." It's a tale of ecstasy and agony: One person's gain from others' pain playing out across America. "It's unfortunate for those who are going through such tough times," says Mary Ann Lepley. "But in some ways, we were really glad that we were able to do something we wouldn't have been able to do otherwise."